The CutterControlPanel Software offers totally new possibilities of user guidance. The user has all information on cutting data on the PC-screen and controls all processing functions comfortably by mouseclick. 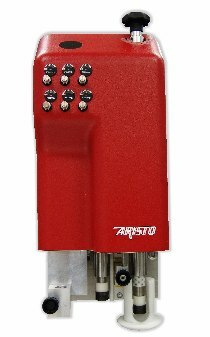 ARISTOMAT TL High Speed Cutter of the new Generation Essential functions such as manual control or setting of origin can be carried out from any point of the cutter by means of a mobile control pad.